The current active MLS listings of Homes for Sale in Indian Paintbrush follow below. For assistance, call Jim at 512.913.1557. 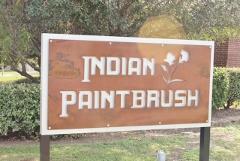 Location: Indian Paintbrush is located mid-way between Kyle and Buda, Texas on the east side of IH-35. From Austin, take exit #217. Turn left across the overpass onto Windy Hill Rd. Just past Amberwood (Cherrywood Dr.) turn right at Indian Paintbrush Dr.
Ths table gives an overview of real estate activity in Indian Paintbrush over the past several years. Indian Paintbrush Kyle real estate market data from the Austin Board of Realtors, 1/1/11 - 12/31/18. The approximately 260 homes in Indian Paintbrush were built in the years 2003-2006 by Nuhome Homes (Lennar). Lennar also built some of the homes in the adjacent Amberwood subdivision. The street names in this subdivision come from common Texas wild flowers and plants: Indian Paintbrush, Buttercup, Dandelion, Prairie Verbena, Sawgrass and Peppergrass. Indian Paintbrush homes are very livable, and are typically more affordable than many others in the Kyle and Buda area. They would make good entry-level homes in the Kyle area for many potential buyers. Home sizes range from 1,238 sq. ft. to 2,417 sq ft. per Hays County records. Both 1- and 2-story resale homes are available from time-to-time. They feature either 3 or 4 bedrooms, 2-2.5 baths, and lot sizes ranging from 0.12 to 0.59 acres. Indian Paintbrush is ideally located just off the IH-35 corridor. It is out of the Austin or San Antonio metro areas, but is close enough to them to enjoy all that they offer. For those needing to save travel time, the SH-130 toll road is a good option. Connect to it via IH-35/US-71 a few miles north of Indian Paintbrush or via toll road SH-45. The Home Depot and EVO Entertainment complex are located just across IH-35 in Kyle Town Centre. If you need outdoors (hunting, fishing, camping, etc.) equipment, visit Cabela's just to the north in Buda. A short distance from Indian Paintbrush to the south in Kyle are three large retail developments (Kyle Crossing, Kyle Marketplace, The Village at Kyle).These feature popular big-box stores: WalMart SuperCenter, HEB Plus, Target, Ross & Lowe's, e.g., and other smaller business shops. The Seton Medical Center Hays Hospital is located in the Village at Kyle. South Austin's popular Southpark Meadows retail center is located a few miles north of Indian Paintbrush at IH-35 and Slaughter Ln. Residents are also close to the San Marcos/New Braunfels area and their many options for shopping and recreation. These include the popular Tanger and Premium Outlet centers in San Marcos. Golfers can play at Kyle's Plum Creek Golf Course. The City of Kyle's Lake Kyle and Steeplechase Park are easily accessible by residents of Indian Paintbrush. Residents of the Indian Paintbrush subdivision are required to belong to the neighborhood HOA (Homeowners' Association). As with other HOAs, the fees are used for upkeep of common areas. There are no community amenities (pool, playground) in this neighborhood. Fees are approximately $15 per month. The primary taxing entities include the City of Kyle, Hays County, and the Hays Consolidated ISD. Children living in Indian Paintbrush go to schools operated by the Hays Consolidated Independent School District (HCISD). Parents are encouraged to verify current school assignments with the Hays CISD since school attendance boundaries are sometimes redrawn.